Yep, it is cold out there. I was thrilled that the driveway finally melted dry yesterday only to discover it covered with an inch of snow on top of a bulletproof layer of ice this morning. The trees had inch long hoar frost! Beautiful, but a little dicey taking the trash cans to the bottom of that driveway. What a great day to knit. I decided that I absolutely needed to try to make a lace mitt on cable needles, so risking my life on the driveway I headed out to the LYS briefly to get two 2.25 mm red lace ChiaoGoo cable needles. I scored 16″ needles and headed home (with a side trip to IKEA on the way back to score some cinnamon rolls…) to cast on. OK, it’s only the start, but they make me happy. 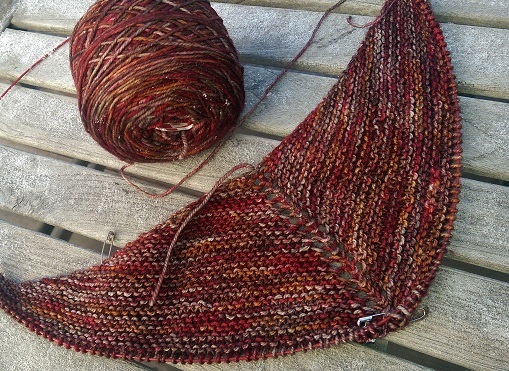 The yarn is La Jolla by Baah Yarn. 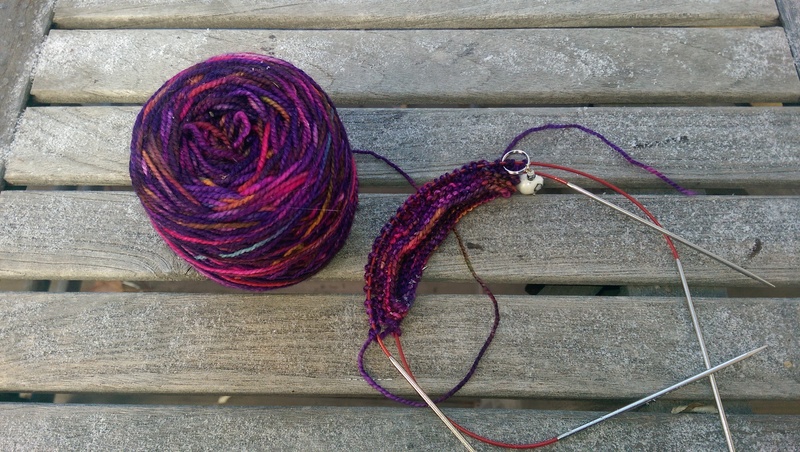 I once lived and worked in La Jolla (California), so it makes me really happy to knit this yarn. To make it even better, the colorway, “Breakfast at Tiffany’s” is a special dye job for the owner of Colorful Yarns. Can you tell Tiffany’s favorite color is purple? The end is in sight. I need to stop going on knitting detours and get these done! Now that I have cast on a mitt and gotten far enough along to see how to do it, I need to get back to the socks that I am working on right now. 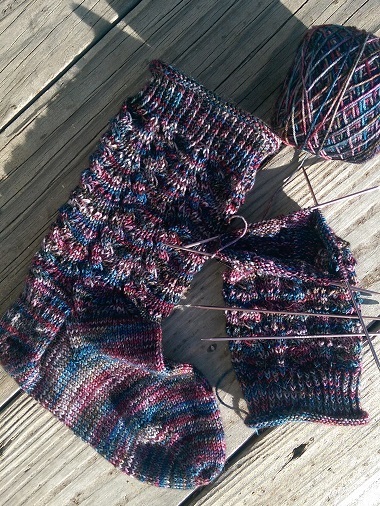 I’m almost down to the heel flap on the second sock, so I really do need to buckle down and get them done over the next couple of days as there is more snow coming at the end of the week. Woo-hoo! Knitting weather! This yarn is 20% cashmere. It sure would be nice and warm to wear. Sock pattern: Chouwa by Judy Sumner (in the book Knitted Socks East and West) Sock yarn: Hedgehog Fibres Sock, colorway Malice.